These are animals that live in some realms of the gods, in the human realms, and the nagas who live under the four continents or in the depths of water. “Then there are the various kinds of dragons (nagas) which receive day and night and without intermission the tortures of the Three Heats”. These three heats which are sometimes named “the three torments” are: 1. their skin and flesh are burnt by a hot wind and sand-storm, 2. an evil wind strips them of their clothes and thus deprives them of any protection from the heat, and 3. they are attacked and eat by Garudas, a kind of combination of spirit-like being with miraculous powers, in the form of a giant bird. The animals who live in our realm and the realm of the gods suffer from both eating one another, and from exploitation. They are hunted or raised for their meat and various products of their bodies, thus experiencing inconceivable torments and almost none of them dying a natural death. There's the extremely unbearable devouring of one another”. Beaten with kicks, fists, or whips, or with hooks or with prods." 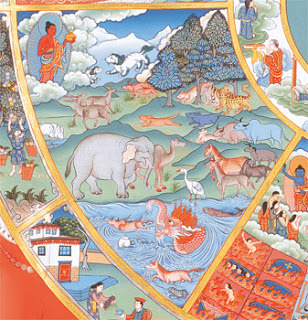 In accordance with Abhidharmakosabhasyam by Vasubandhu, the lifespan of most long-lived animals is no more than an eon, while the life spans of short-lived animals is not fixed. Mount Sumeru is a cosmological mountain, like an axis of the world. Every samsaric world or universe has a mount Sumeru, or an axis in relation with which all the six planes of existence are described. A Dictionary of Japanese Buddhist Terms, by Hisao Inagaki in collaboration with P.G. O’Neail, Nagata Bunshodo, Kyoto, 2003, p. 271 (Sannetsu).